Triplet Falls is probably the most scenic of all the waterfalls in the Otways. If you are lucky enough to see them in winter after the rains they are a spctacular sight. The falls are located at the very end of Philips Track near Beech Forest. The Otway Fly is on this road so it really is a must see while you are there. The walk is fairly easy - perhaps a little steep on the way back. The Little Aire Falls is also located here. They are not as spectacular but it's a lovely 2 hour return walk through the forest. This image belongs to the travel and nature stock photo library. This stock photo of Triplet Falls is available for licensing for commercial and editorial uses including websites, blogs, books, magazines, brochures and advertising. Restrictions may apply for images which contain third party copyrighted material or sensitive subjects. Photos of artwork are for editorial use only. 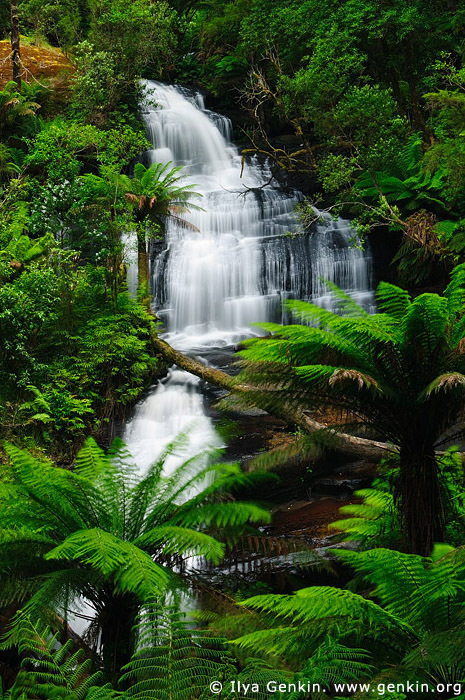 This image id VIC-TRIPLET-FALLS-0001 of Triplet Falls, is copyrighted © by Ilya Genkin. This is not a public domain image.